Publisher’s summary: When Ruby wakes up on her tenth birthday, something about her has changed. Something alarming enough to make her parents lock her in the garage and call the police. Something that gets her sent to Thurmond, a brutal government “rehabilitation camp.” She might have survived the mysterious disease that’s killed most of America’s children, but she and the others have emerged with something far worse: frightening abilities they cannot control. My take: Oh! My! Gosh! The Darkest Minds is so good! But despite how good it is, I struggled with how I should rate this book. If I were rating the book primarily on the story and the last 100 pages, then this book, without a doubt, would be a 5-star rating. The reason I lowered it to 4.5 stars is because I felt like this book just took me a lot longer to read than normal. I mean, every time I picked up the book, I was intrigued enough that I wanted to know where the story was headed, but I could only handle reading 20 to 30 pages at a time. However, if the story continues along the same lines that it ended, then I have no doubt that this will be a series that I’ll be obsessing over. 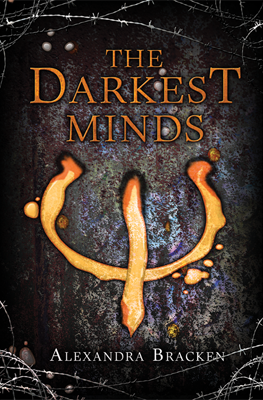 When I first started reading The Darkest Minds, I was a little freaked out by how the story started. In the beginning, Alexandra Bracken did a fabulous job creating a horrible, dark picture of what was happening in the world. There was one scene in particular that was so unbelievably insane that, even though I was sitting by myself, I’m pretty sure I said out loud, “What?” It was really that well done. Throughout the story, Alexandra kept holding back some specific details about Ruby that I was extremely determined to discover. It was as if Ruby was refraining from even thinking about these details. So we have to learn about them at the exact same time that Ruby tackles the memories in her own mind. But it was the last 100 pages of the book that were beyond insanely good…and I just could not put the book down until I finished them. All of the characters in this story were very well developed. And, even if I wasn’t happy at times with some of the character’s actions…or if I didn’t particularly didn’t like a character…or even if I ended up outright hating a character, Alexandra Bracken was able to make me understand the reasons for their actions and understand why they were the way they were…whether I liked it or not. The number one thing I want to learn from future books in this series is whether or not there is any way that Ruby will be able to fix the damage she has caused (you’ll have to read the book to understand what I mean), and I’m also dying to know the common link or the cause to what happened to all the children in this apocalyptic, future world. And lastly, I’m more than a little eager to find out what ultimately will happen to all of the characters. I've been reading a few books lately that are somewhat slower and kick into high speed the last 100 or so pages. I'm glad you stuck with it since you liked the end so much. This book is one I am definitely looking forward to. It sounds so good. Awesome review!! I'm really looking forward to this one! It sounds SO good! I fell in love with this book. a friend brought it to school one day and I just had to have it. so I bought it for my kindle fire. She saw I was reading it and that's all we could talk about. it's amazing.